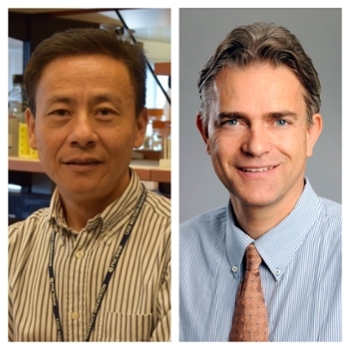 Two cancer researchers with the Winship Cancer Institute of Emory University have been awarded $100,000 grants from the St. Baldrick's Foundation to support their work in finding new therapeutic approaches to treating childhood cancers. Erwin Van Meir, PhD, leader of Winship's Cancer Cell Biology Research Program and program director of the Emory Graduate Program in Cancer Biology, is receiving a $100,000 "Heroes for Hannah" St. Baldrick's Research Grant for investigating a new brain tumor suppressor pathway. This is the second St. Baldrick's grant Van Meir has received for his work on medulloblastoma, the most common malignant brain tumor found in children. This research project in Van Meir's lab will be led by research associate Dan Zhu, PhD. "We are grateful to the St. Baldrick's Foundation who has helped us initiate a new line of research in our laboratory to probe the importance of a novel tumor suppressor (BAI1) in medulloblastoma," said Van Meir. "We hope our findings will open new avenues for treatment of children with this disease." Cheng-Kui Qu, MD, PhD, a Winship member, professor in Emory's Department of Pediatrics and researcher for the Aflac Cancer and Blood Disorders Center of Children's Healthcare of Atlanta, is receiving a $100,000 St. Baldrick's Foundation Research Grant to support his work on finding a way to kill cancer cells at the root of juvenile myelomonocytic leukemia (JMML), a fatal childhood malignancy. Relapse is the main cause of treatment failure for this leukemia and Qu's research is exploring a novel approach to target the leukemic precursor stem cells that cause relapse. "This grant allows me to continue this exciting research and move closer to developing therapeutics for this devastating disease," said Qu. The grants will support fundamental scientific research that is vital to Winship's mission of translating scientific discovery into advanced cancer treatments and clinical care. The St. Baldrick's Foundation is a volunteer-driven charity committed to funding the most promising research to find cures for childhood cancers.